For 60 years, incarcerated people in California have been fighting the state’s wildfires for a pittance, even as the fires have grown larger and deadlier thanks to recent drought and climate change. The state’s attitude and statements about the program demonstrate a mindset that considers incarcerated people resources, at the service of California’s general population. The Conservation Camp program is run jointly by the California Department of Corrections and Rehabilitation (CDCR) and the California Department of Forestry and Fire Protection (now known as Cal Fire). Forty-three camps dot the state, including three for women and one for juvenile offenders. Inmates are paid $2 per day, plus $1 for each hour spent on the front lines, which is nevertheless astonishingly considered high for prison wages. For each day of good behavior in the camps, workers get two days off their sentence. They also get better food, safety and physical fitness training, more relaxed family visits, and a chance to be outside in nature instead of behind prison walls. The state of California gets an average of eight million hours per year of dangerous labor, for which they pay professional firefighters an average of $17/hour, virtually free. Four thousand inmates fight wildfires in California, making up about 30 percent of the force and reportedly saving the state about $100 million every year. (Never mind that the state has also estimated that it costs taxpayers nearly $71,000 a year to house and safeguard a single prisoner). “The state of California is unabashed by that fact,” the director of Criminal Justice & Civil Liberties Policy at the conservative R Street Institute told Philip Wegmann of the Washington Examiner. The San Quentin News, a newspaper written, edited, and produced by residents of San Quentin prison, quoted Julie Hutchinson, a Cal Fire battalion chief, saying inmates are “very cost-effective” and “they’re out in the community, paying back for their mistakes.” Considering three inmates have died since 2012, it seems an awfully high price. Prison officials defend the programs as beneficial to the inmates. 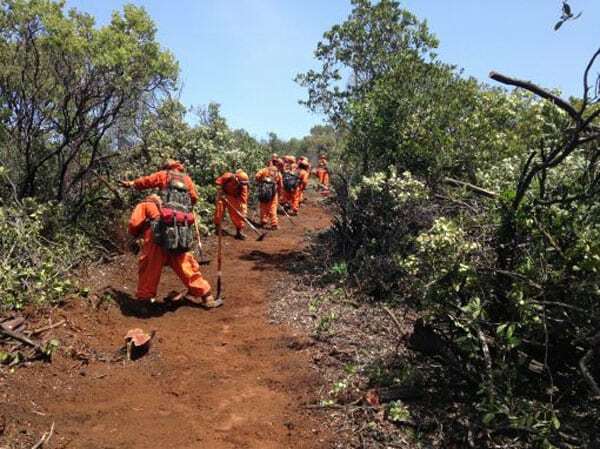 Daniel Berlant, a spokesman for Cal Fire, said, “This is a reward for many of these individuals… They’re outside the walls, doing good work, learning a skill that they may not get behind bars.” Again, let’s remember, they’re learning a skill they will be unable to use because of the very circumstances that put them here in the first place. The SQN also quotes Bill Sessa, spokesman for CDCR, saying, “It’s difficult to call them enslaved when they’re volunteering to do the job.” But again, what are the real choices inmates face? California has been using the labor of incarcerated persons ever since men who were being held prisoners on a ship built the first state prison in 1853. Wages began to be paid in 1923, and the firefighting program started in the 1960s. This means the state has always counted on this nearly free labor in making its budget. Following months of protests by thousands of employees, Google agreed to stop requiring its workers to submit to forced arbitration in employment disputes.